Around the time that Susan Roach gave notice that she was retiring after 12 years from her post as administrative assistant at the Historical Society of Ocean Grove, an email arrived from a young woman offering to volunteer. Her name was Anna Critelli and she was a freshly minted Ph.D. who had specialized in historic preservation. Newly married to a physical education teacher in Long Branch middle school, she had recently moved with her husband to Ocean Grove and discovered the Historical Society. Society president Gail Shaffer suggested that Critelli apply for the vacant job. Says Shaffer, “Then we got her resumé and we were blown away.” Not only had Critelli earned a doctorate from West Virginia University with a 4.0 average, and not only did her list of awards and honors contain 11 entries, but she had work experience as a teaching assistant and also in West Virginia’s State Historic Preservation Office, where she wrote regional architectural histories and even a brochure on historic wood windows. Critelli quickly rose to the top of the list of 10 people being interviewed, culled from the 20-plus applications the Society had received. Add to her qualifications an outgoing personality and computer skills. Repeat that: computer skills, as in Omeka, Adobe Photoshop and Microsoft Office Suite. “We’re thrilled she knows computers,” Shaffer said. 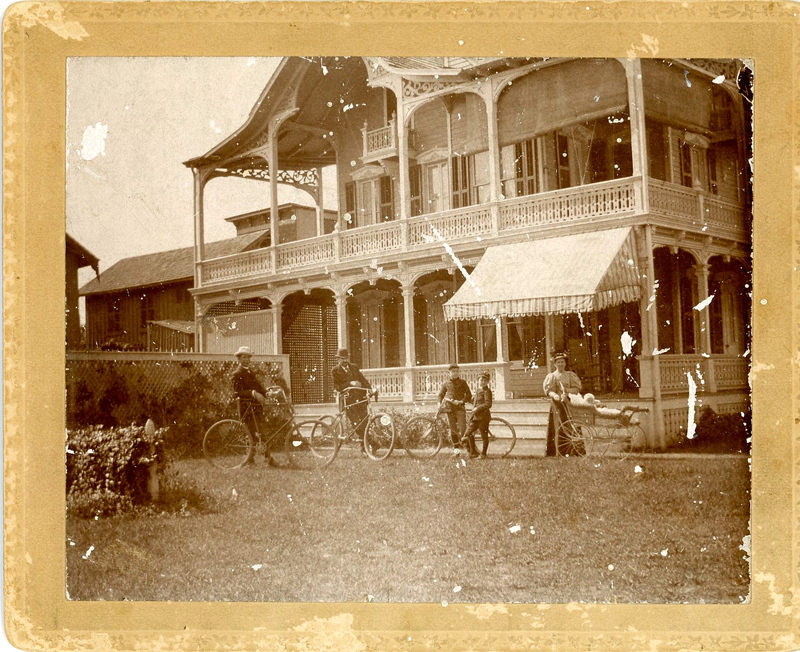 Historian Lyndell O’Hara explores women’s role in Ocean Grove from 1870 to 1900. The year is 1858. Margaret Coleman is awarded a medical degree, becoming one of the country’s tiny number of female physicians. But in Ocean Grove their numbers are swelling. By 1900 five of the town’s 10 doctors are women. Nationwide, the figure is just 5 percent. Block House likely featured the therapeutic salt baths spiked with electricity — sometimes too much electricity — that were popular in those days. “Occasionally they lost a few people,” Lyndell O’Hara tells a rapt audience of 29 people, who have signed up for her women’s history tour sponsored by the Historical Society of Ocean Grove. The group is standing in the shade of a stately sycamore across the street from 40 Pitman, now the Allenhurst apartments. 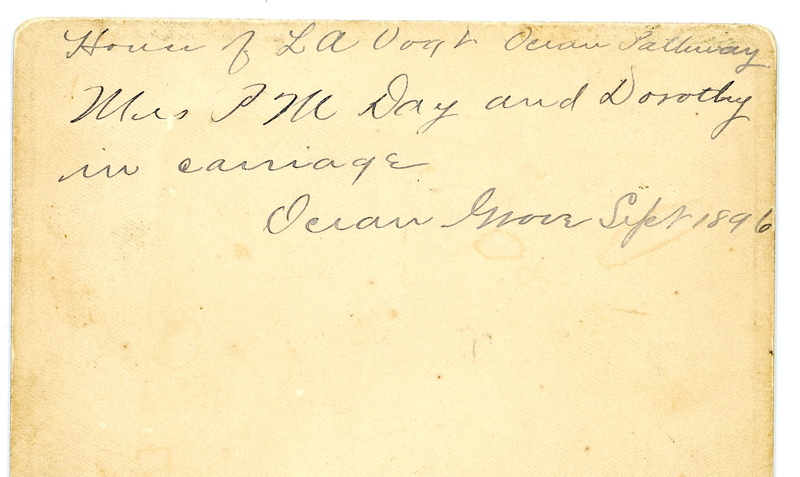 O’Hara gleaned the news of salt bath casualties from the Ocean Grove Record for that period. A history professor at the Manhattan campus of Nyack College and an Ocean Grove resident for the past decade, O’Hara has spent three years exploring the role of women in Ocean Grove from 1870 to 1900. From census records, newspapers, Camp Meeting Association yearbooks, biographies and other materials she has painstakingly assembled a surprising portrait of a feminist haven. During those three decades the Grove was both a center of the Holiness movement, which allowed women to develop as religious leaders, and a stronghold of the Women’s Christian Temperance Union. “Because of the Holiness movement and temperance, women gathered here every summer,” O’Hara said. By 1900, 64 percent of the Grove’s population was female. In Asbury Park it was 56 percent, in Long Branch 51 percent. Among the boldface names who spent considerable time in Ocean Grove were Phoebe Palmer, known as “the Mother of Holiness;” Frances Willard, president of the WCTU, and Amanda Berry Smith, a world-famous African American evangelist. Not only did women flock to the Grove, they put down roots and prospered in business. 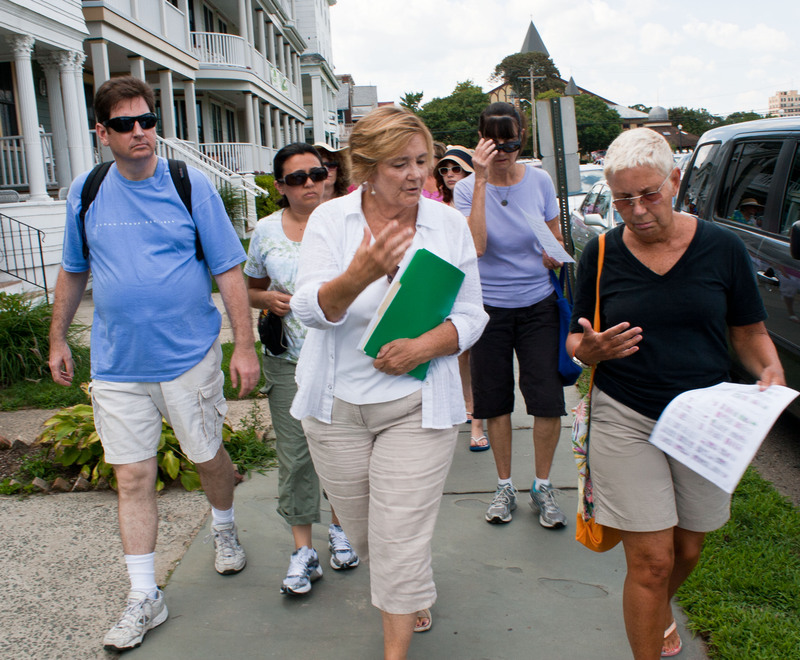 “Ninety percent of the tourist business was run by women,” O’Hara told the group. Many of them were single or widowed. They owned and operated boardinghouses and cottages, or they rented boardinghouses from owners and rented out rooms. The industrious Carolyn Sissom somehow managed to lease 14 lots from the Camp Meeting Association when two were the limit and turned herself into a real estate maven. Forty Pitman was the first of nine stops on O’Hara’s recent tour. Another was the site of the Manchester on Ocean Pathway, which was destroyed by fire in 2010. It was owned in the 19th century by Kate Kellogg, who had lived in Pennsylvania with her husband and two daughters. After her husband’s death she moved to the Grove and supported herself by taking in boarders until she was in her early 90’s. Thus far this summer O’Hara has led two tours, with a third scheduled for 1 p.m. August 30. The cost is $8 and reservations are advised. This Wednesday’s Planning Board meeting will mark the first time Ocean Grove’s various civic groups have had a chance to air their concerns about the Board’s proposed new Master Plan. 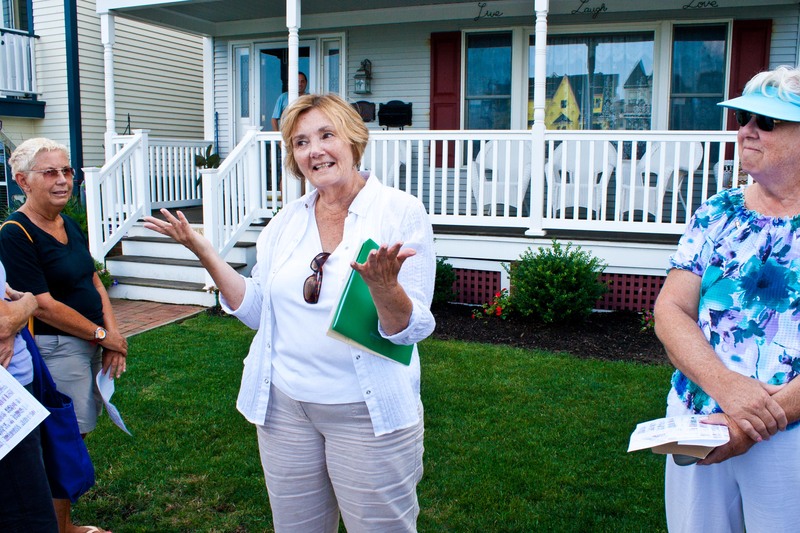 Those concerns – by the Home Owners Association, the Historical Society of Ocean Grove and the Historic Preservation Commission – mainly have to do with protecting Ocean Grove’s unique historic character from developers or others who would undermine it. Leaders of those three organizations showed up at the Planning Board’s September 14 meeting hoping to make themselves heard. To their disappointment, no one in the audience was allowed to speak. Although all three organizations have written letters to the Planning Board detailing their concerns, the Planning Board has not responded to those letters. And in recent weeks, when Blogfinger offered the Planning Board a chance to address these groups’ concerns on our website, the offer was declined. It is fair to say that a growing number of people believe the Neptune Planning Board has distanced itself from the public – on issues of heartfelt concern to Ocean Grovers. The HPC has similar concerns. The Planning Board’s document says that the proposed new committee would only be empowered to approve “minor changes that have been found to be di-minimus” [sic]. Critics wonder why a new layer of governmental authority is needed for matters that are de minimis (that is, of negligible importance). They also question who, within the recesses of the Township government, would decide what is or isn’t de minimis. “A small change to zoning can be a humongous change to historic preservation,” said Deborah Osepchuk, who chairs the HPC. The Home Owners Association is also urging that existing zoning limits be maintained on building heights and number of stories. “We, like many other Ocean Grovers, are concerned about recent trends toward greater height and greater density,” the group wrote in its letter. The HPC and the Historical Society have a range of concerns about a part of the new Master Plan draft called the Historic Preservation Element, which is especially important to Ocean Grove. Both organizations think the new draft should do a better job of explaining why Ocean Grove was named as a State and National Historic District, as an example of a 19th century planned urban community. The previous Master Plan went into eloquent detail about those characteristics that make Ocean Grove historically unique and in need of protection. Omitting or abbreviating that information, says Osepchuk, weakens Ocean Grove’s ability to protect those cherished characteristics. It might also affect the town’s ability to get grant money for certain restoration projects. The previous Master Plan contained a list of some of Ocean Grove’s so-called “key structures,” i.e., structures most in need of preservation due to their exceptional importance architecturally and historically. The Planning Board’s rewrite omits that list. Having the list in the Master Plan, according to the HPC, bolsters the validity of Ocean Grove’s historic status. The HPC often refers to that list of structures in its deliberations and decisions. To read the Home Owners Association’s letter to the Planning Board, go here. 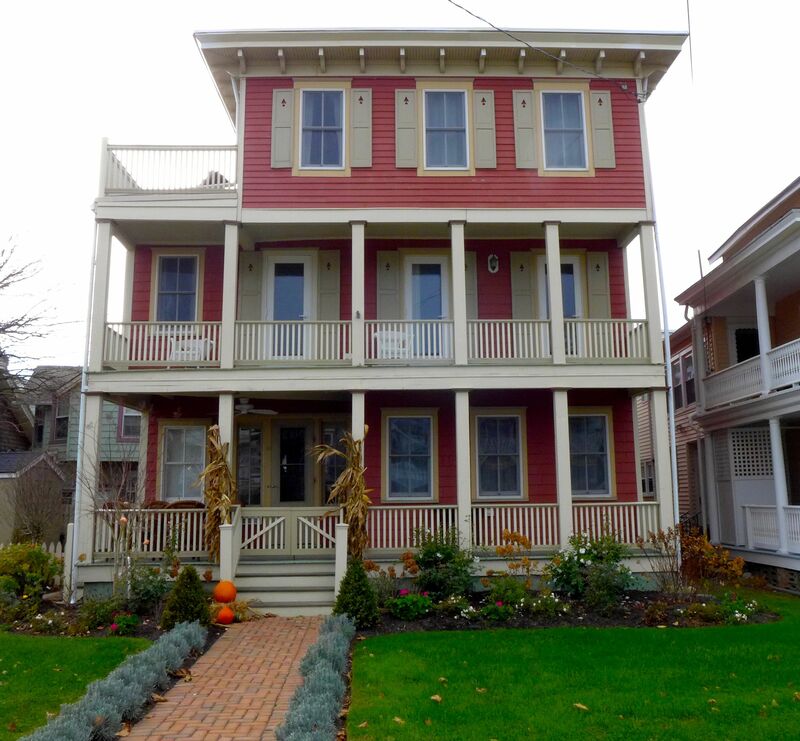 To read the Historical Society of Ocean Grove’s letter to the Planning Board, go here. To read the Planning Board’s proposed new Master Plan on the Neptune Township website, go here. Then scroll down to “Draft Elements of the Master Plan.” The elements of most concern to Ocean Grovers are those on “land use” and “historic preservation.” You can click on each of those separately. Editor’ note: Because there’s more than one side to every story, our offer remains open to anyone on the Planning Board who wants to address any of the above concerns, either before or after Wednesday night’s meeting. What was once a handsome four-tier fountain, the centerpiece of Founder’s Park, today is a forlorn structure half its original size, surrounded by ugly orange plastic netting. Constructed in 1907 by the J.W. Fiske Iron Works of New York, the fountain was already in disrepair when a vandal threw soap into it in the 1970s, clogging its plumbing forever. Gone are the top three tiers, the four urns that perched on its water-filled base and the pipe railing that surrounded it. The design on its pedestal featuring scallop shells, drills and tulips is barely visible, and the pedestal itself is deeply cracked and corroded. A ragged fringe of cannas and pink vinca encircle what’s left, representing a valiant attempt by Ocean Grove Beautification to improve its appearance. Grass sprouts from the top basin. But help for the fountain, says Bell, may be on the way. In his research, Bell discovered that a company in Alabama called Robinson Ironworks had purchased Fiske. From Luke Robinson, of the iron works, he learned that the company still had the original molds used to cast the fountain. And on Wednesday Robinson is arriving in Ocean Grove to evaluate the fountain for possible restoration. Under Bell’s leadership a committee of the Historical Society of Ocean Grove plans to explore the availability of federal, state and county funds. The other committee members are Society president Gail Shaffer, Liz Ogden, Phillis Keutgen, Darrell Dufresne and Rose Myers. Founder’s Park is the most historic site in Ocean Grove, the very place where Methodist elders gathered in 1869 and decided to establish a religious community. Several trees that shaded that august gathering still cast their shadows over the lawn.